Besan ki mithai for everyone yayyyyyyy! 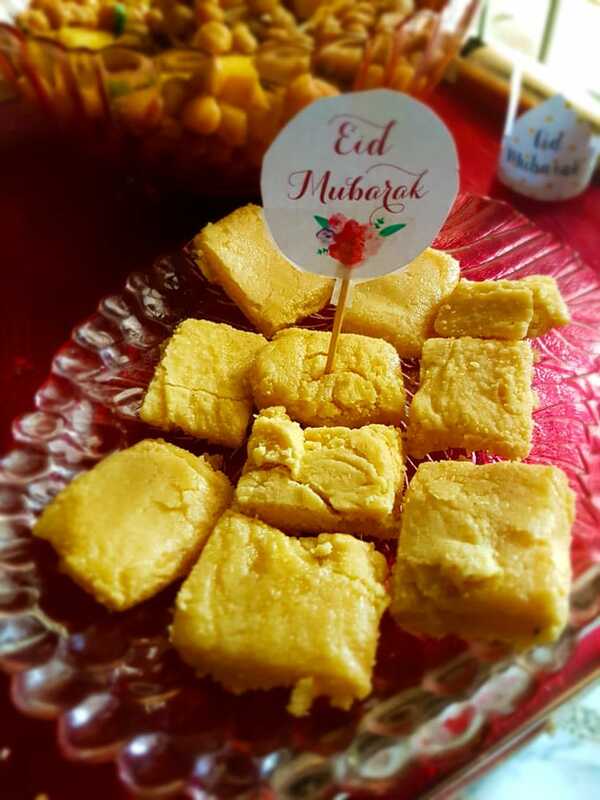 My mom and I made besan ki mithai for Eid-ul-Fitr this year, and it was a great hit with our guests. The adults loved it, the kids loved it, and even the most health conscious members of our family were grabbing an extra serving. The funny thing is that it wasn’t at all what I had planned for this Eid and almost didn’t happen. So why did we end up making besan ki mithai? Funny story. You see, I thought my mom had the recipe, and my mom thought that I had the recipe. By the time we realized that neither of us had it, we only had a few days left before Eid. We ended up scouring every notebook in the house in the hopes that my mother-in-law had written it down somewhere. The good news was that she did note down the ingredients. The bad news was that it was just that—the ingredients, written very vaguely and with no explanation of how to put them together. I could probably figure it out with a few experiments (and I plan to, Inshallah), but I didn’t have the time to do that with Eid just around the corner. 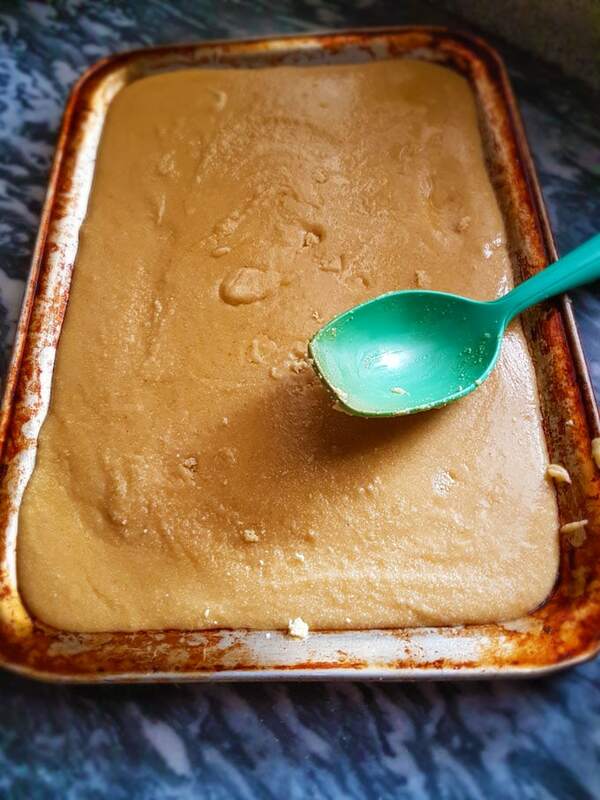 The solution was to make our own version of besan ki mithai, a recipe that my mother did have. We made a test batch and the biggest surprise was how much my kids loved it. Subhanallah, they would have finished up that entire first batch if we had let them! 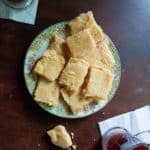 My four-year-old is a bit more willing to try new things, but my seven-year-old is a very picky eater, so if this besan ki mithai recipe meets his approval, I know it’s good! Grease a large cookie sheet and set aside for later. To start, combine two cups of suji (semolina) and one cup of besan (gram flour) in a medium sized pot. Place over low heat and lightly toast until the color changes slightly towards a golden brown. You should be able to just smell the aroma of the suji. While your dry ingredients are toasting, combine two cups of malai (or thickened cream), with two cups of sugar in a saucepan. Add to this either 1/4 tsp of cardamom powder or a few drops of khewra essence. Put this on a low flame, stirring until the mixture comes to a boil and the sugar dissolves completely. Keep a close eye on it, because cream boils over very fast. This next part will require you to work very quickly, so take note. When the cream and sugar mixture has boiled until the sugar has dissolved completely, pour this into your dry ingredients. Quickly, but thoroughly combine the wet and dry ingredients together until you don’t see any of the dry ingredients remaining. Pour this mixture onto your greased cookie sheet and spread evenly. You can use a greased spatula to smooth it out, if you’re particular like that. I just used the back of the spoon I used for mixing. Let this cool and firm up a bit until you can easily cut it. Cut in squares or diagonally in diamonds, if you like. Optionally, for garnish, you can add silver varak (put the sheets on before cutting the mithai) or almond slivers. We wanted to be considerate of any potential food sensitivities of our guests, so for Eid, we decorated our mithai with these lovely Eid Mubarak cake toppers from Sweet Fajr. 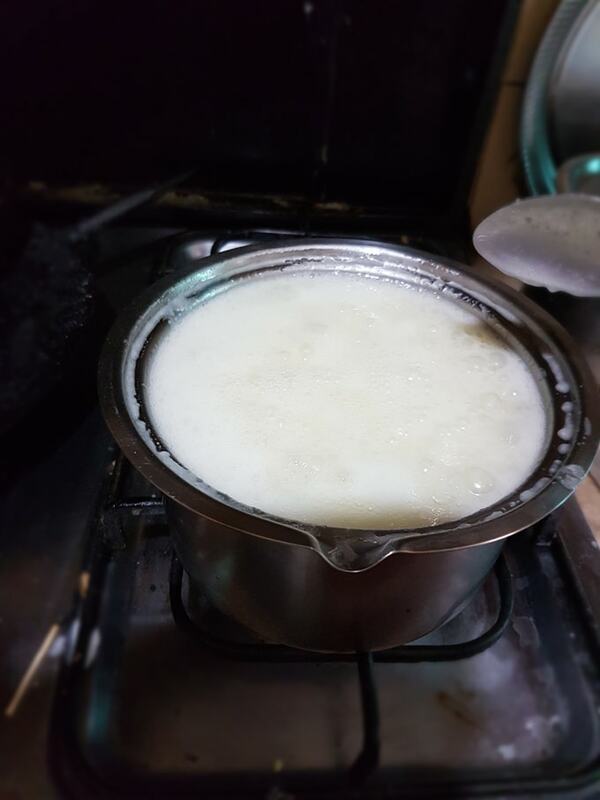 By malai, I am referring to the thick cream that comes from raw milk after boiling and cooling in the fridge. If you don’t have access to malai, use any thickened cream or even heavy cream. The thicker your cream, the softer and chewier your mithai will be. (And yes, I know, I had you guys on the Ramadan Weight Loss Diet Plan and now I’m telling you to cook with heavy cream. But like I mentioned in that post, it’s all about moderation! 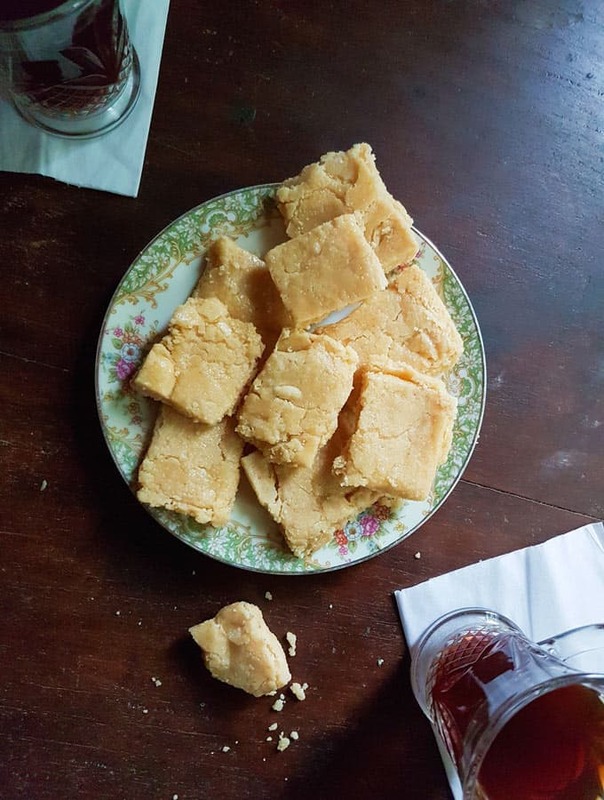 So you can have your besan ki mithai and eat it too…just not everyday. As for the cardamom, I realize that it can be expensive, which is why we put in the khewra substitution. We used the khewra in the besan ki mithai for Eid because some members of our family are picky about cardamom. If you do opt for khewra, please note that there is a very big difference between khewra ESSENCE and khewra WATER. We use SAC brand khewra essence which is very concentrated, so we only used 2-3 drops for the entire batch. If you are using any other brand, I’d say start with a drop or two and work your way up. We switched to a different brand for the second batch and it ended up being way too strong. You can use khewra water for this, but it is less concentrated, so you would need to use more of it. Since I don’t have access to it here in Islamabad, I can’t advise you on how much you should use. Besan ki Mithai is best served fresh as soon as it hits room temperature. The pieces stay soft and slightly chewy that way. If you plan on making ahead, or just want to save the leftovers, refrigerate in an air tight container. It might not be strictly necessary, but since these are made from cream, it’s better to stay on the safe side. Store it in the fridge, especially these days when it’s super hot outside. 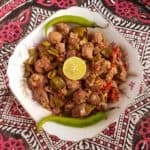 And that’s all for this recipe! Hope you guys make and enjoy the besan ki mithai. If you do, please let me know in the comments below, or take a picture and tag me on Instagram @BeckyKeepsHouse. 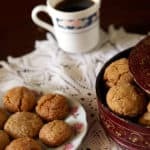 What are your Eid traditions? 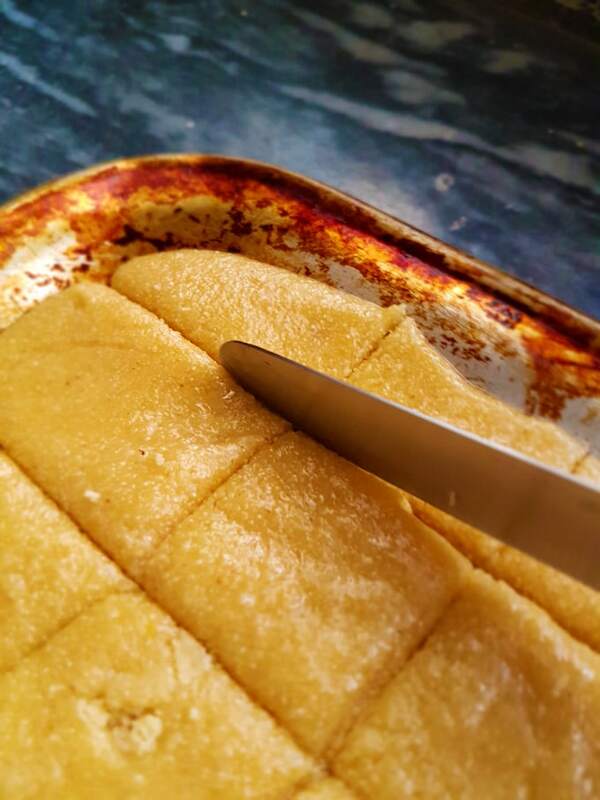 Besan ki Mithai is an irresistible Pakistani sweet made from semolina and gram flour. Easy to make and perfect for tea parties, family gatherings and Eid! 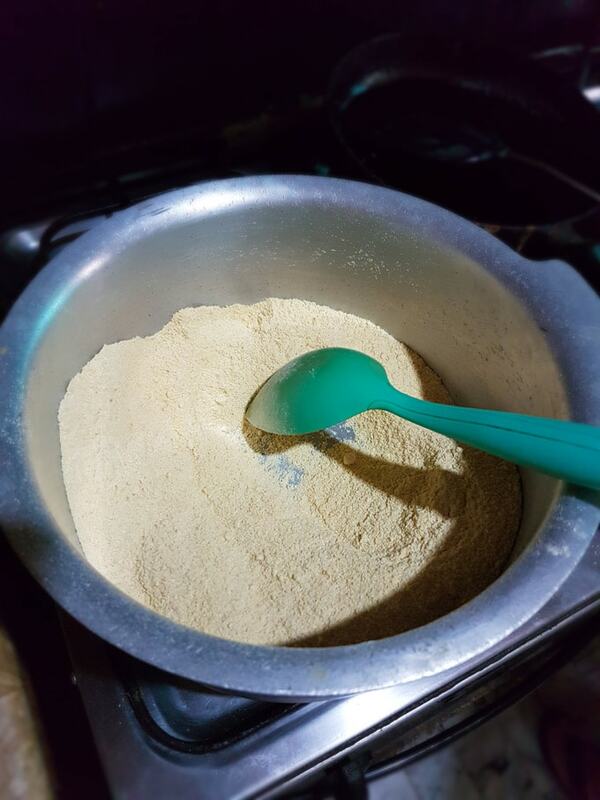 Combine two cups of semolina and one cup of gram flour in a medium sized pot. 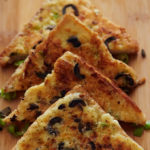 Place over low heat and lightly toast until the color changes slightly towards a golden brown. 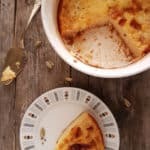 You should be able to smell the aroma of the semolina. While your dry ingredients are toasting, combine two cups of thick cream, two cups of sugar and 1/4 tsp of cardamom powder in a saucepan. Put this on a low flame, stirring until the mixture comes to a boil and the sugar dissolves completely. 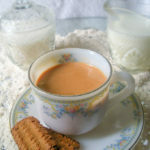 When the cream and sugar mixture has boiled until the sugar has dissolved completely, pour it into the dry ingredients. Quickly, but thoroughly combine the wet and dry ingredients together. Pour this mixture onto the greased cookie sheet and spread evenly. Use a greased spatula to smooth it out. Allow to cool and firm up a bit until you can easily cut it. Cut in squares or diagonally in diamonds. Optionally, you can garnish with silver varak or almond slivers. Put these on while mithai is still soft. Use malai, if you have it. If not, you can use store bought cream. If using, add only 1-2 drops of khewra essence because it can be very strong. If using khewra water, use as per taste. Best served at room temperature. To store, put in an airtight container in the fridge.